NOTE: I have no affiliation with these companies, and will not benefit financially from your order. My only benefit-and it is substantial–is the satisfaction of helping you succeed with iPad video production. TASCAM is not a mic. It’s the connection you plug the mic into. But don’t plug it in using just that short wire. Plug TASCAM into an 8 foot extension wire, then the extension wire into the iPad. This gives you more flexibility with the wire, and reduces chances of the wire breakage. You can buy a tripod at Best Buy and similar stores. You’ll want the iPad Tripod Mount. Avoid the one that’s for iPad mini. If you get confused, Live Chat is very helpful. 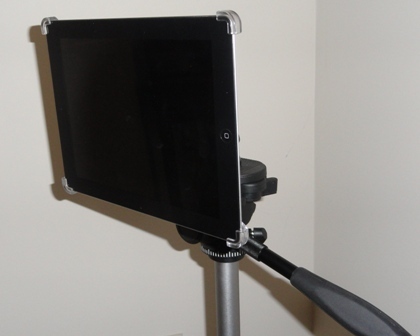 The photo above shows a tripod with the Caddie Buddy frame holding the iPad that has been removed from its protective case and placed horizontally. Caddie Buddy is flexible yet sturdy. I welcome opportunities to come to your business and help you learn to produce top-quality, cost effective videos with your iPad camera. Not only will I demonstrate the steps, I’ll have you do them yourself. You’ll add music, photos, video clips, captions, and even sound effects. Exciting! And your clients will applaud your new look and sound. Plus you’ll change prospects into clients. Visit my Web site’s page on Video production. Be sure to read the client testimonial. Now. . .call me today to arrange my video consulting session at your place!